Desh Bhagat University Training and Placement department organized study visit for its B.Com & MBA and BA LLB Students to Parliament House, New Delhi to give them personal exposure. 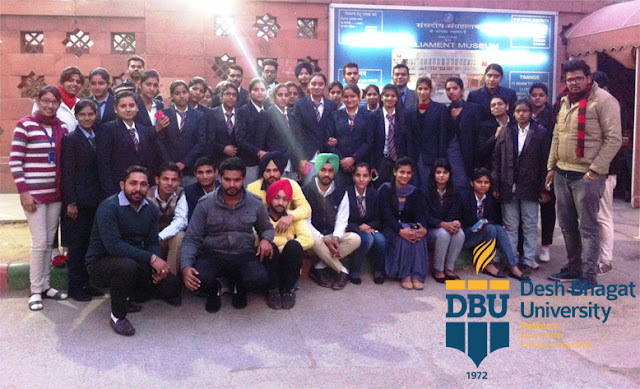 The team of BPST (Bureau of Parliamentary Studies and Training) interacted with all the Students. The study visit consisted of interactive sessions by BPST team and Dr. Deepak Gossain (Joint Director) who gave their expert opinions on parliament working, constitution formation and history of parliament etc. While giving details about this tour, university Pro Chancellor Tejinder Kaur said that 42 university students from different faculties along with the university staff members Ms. Ravinder Kaur, Ms. Kanwaldeep Kaur and Mr. Anish Gupta also took a complete round of the Parliament House, Lok Sabha Chamber, Rajya Sabha Chamber, Central Hall and Lok Sabha Secretariat. Students were given brief information about various chambers of the Parliament House and their functionalities etc. by the secretariat staff.Â They informed the students regarding our constitution, how it was framed and implemented and how the bills are passed in Lok Sabha and Rajya Sabha. The officials also informed the students that all the visitors have to go through a strict security check even inside the Parliament House. Later, students were taken for a round of the Parliament Museum where they were also shown a documentary on Indian Independence and the first speech of Pt. Jawahar Lal Nehru on the Independence Day eve, which enriched the knowledge of students. University Chancellor Dr. Zora Singh appreciated the initiative taken by Ms. Anuradha Rawat and Mr. Gaurav Rastogi of Training and Placement Department of the university saying that such educational visits are very beneficial for the students as these enhance their knowledge and practical exposure. All the students who participated in this tour said that by attending this tour, they have got valuable fresh information about parliament and its functioning.